So, Jon and I are both currently not eating much in the way of carbohydrates or added sugar - just some dietary changes we've decided to try out for the next month or so, since we've been feeling sluggish. Of course, when you have recipe boxes full of cakes and other sugary, carb-y, delicious things, sometimes you have to compromise. Since these fritters are at least 50% apple each, I decided that it would be OK to make them, and perhaps to snack on one or two (okay, it was three, but let's keep that our little secret). 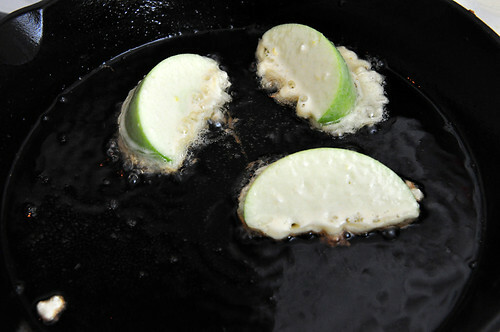 I was just looking at photos of other apple fritters online, and I definitely sliced mine incorrectly. I cut my apples in to 8ths, but it seems that most people choose to cut the apples in to rounds. Oops. Either way, mine tasted good, the apples still had a little crunch on the inside, and the only thing I would do differently is perhaps add some vanilla to the batter. 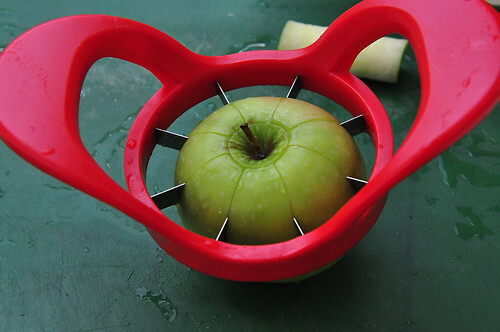 You can slice your apples however you choose. Core and then chop or slice your apples. 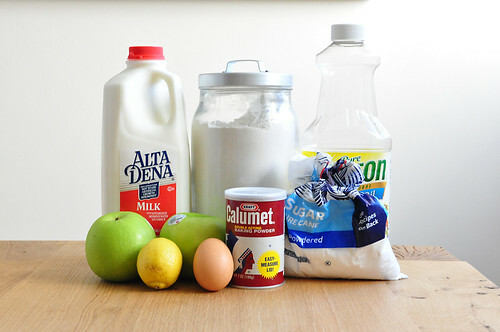 Mix together all ingredients, excluding the apples and powdered sugar. 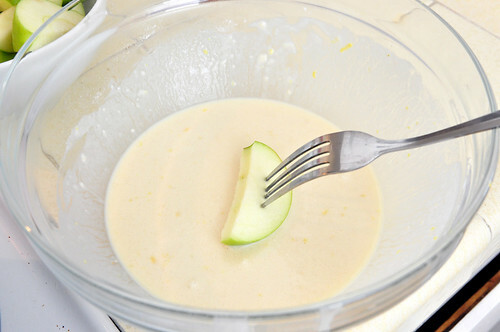 Dip apple slices in batter. Drop in hot oil for 1 minute on each side. Be careful, I managed to splash some oil on my arm (klutz), and now I have lovely painful red burn marks. 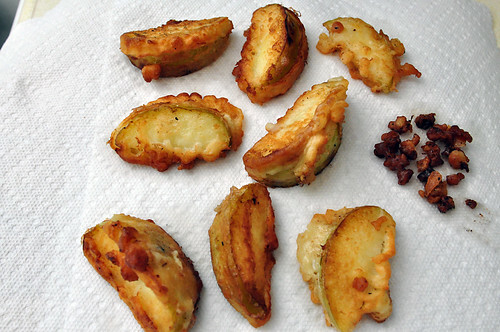 I've been thinking about it as I typed this post up, and I bet that these would be delicious with a little ice cream or fresh whipped cream. Next time, I will have to have some on hand. These look woderful.Can you ship some east? 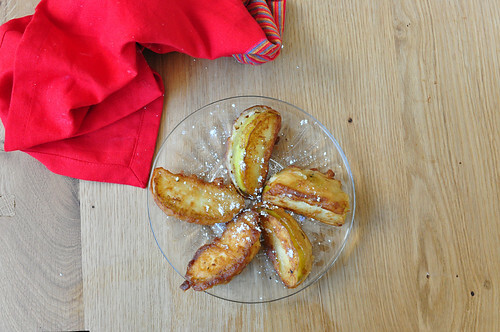 Mmm, an apple turnover sounds perfect right now. 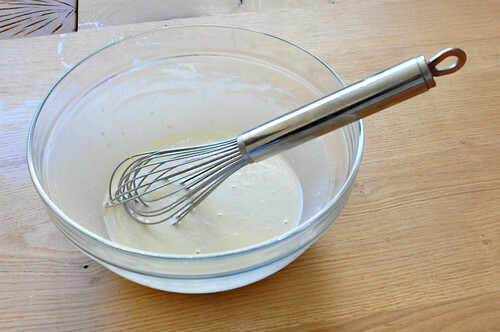 I think I have a lonely sheet of puff pastry hiding in the freezer, I think I now know what it will be used for!